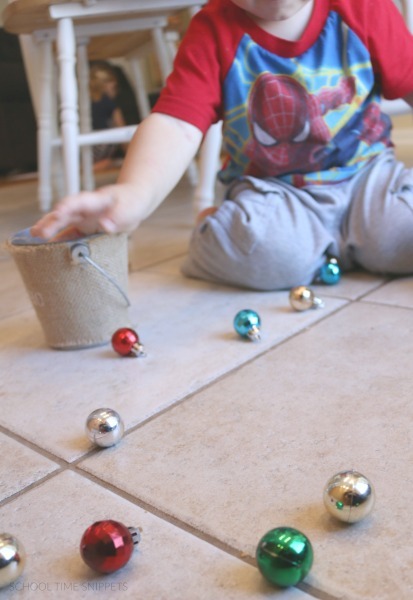 Set up this fun and simple toddler Christmas activity using ornaments! 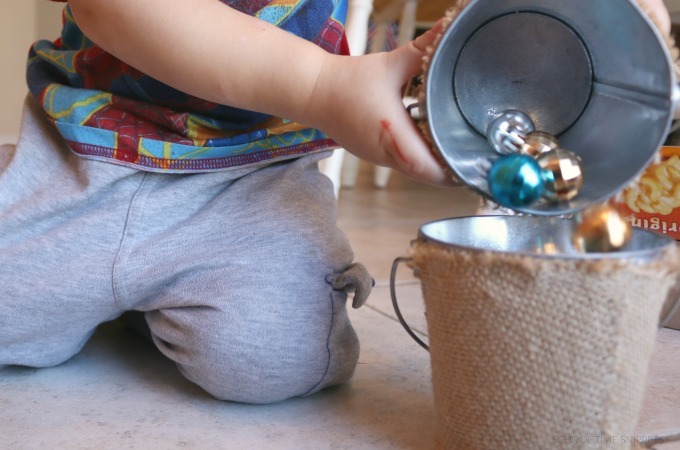 If your little one loves to pour, scoop, and transfer this fine motor activity is for you! 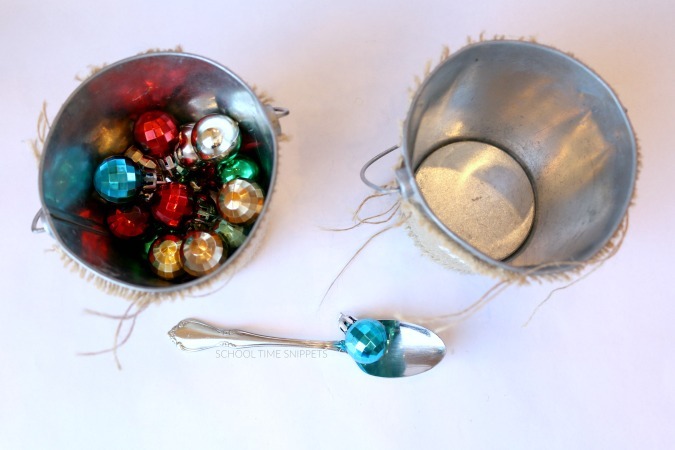 This is a fun and simple way to encourage fine motor skills development this holiday season with your little one! If you leave a glass of water on the table, leave it to the toddler in the family to find another cup to go with it. When the toddler finds a cup, he gets on the table and pours water from cup to cup. But, he needs work on his transferring skills, so water ends up all over the table and floor. Thus is why I decided to give a certain toddler plastic Christmas bulbs to pour instead-- I figured there would be a little less mess that way. I was kinda right, but at least the mess wasn't wet! 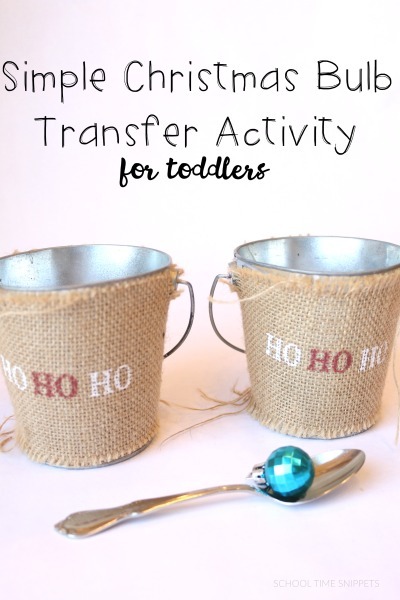 My 20 month old is fascinated with pouring whatever from one cup to another, so being that it is Christmas time, I brought out some shiny Christmas bulbs from our school room closet and set up a simple transfer activity. Fine motor skills involve the small muscles in the hand, wrist, and thumb. Pinching, grasping, rolling, pouring, etc. are all actions that depend on the coordianation of those small muscles. Much later those muscles will be used to learn and refine writing skills. Needless to say, they are very important! To help encourage your childs fine motor development, there are many fun ideas to set up like pouring, scooping, and transffering! 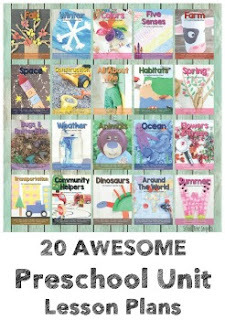 For little hands, those are big tasks! 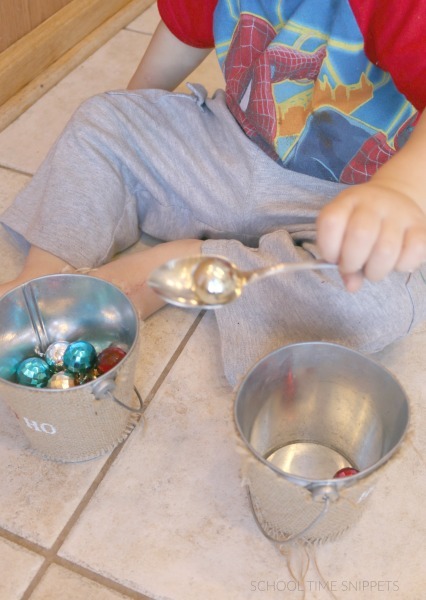 Feel free to use any toddler-safe item for this fine motor skills transfer activity, but being that Christmas is coming, we used these fun and shiny plastic Christmas bulbs. I placed the Christmas bulbs in one container and called my 20 month over to come explore the contents of the container by pouring and dumping. I provided a spoon so he could practice scooping and work on hand-eye coordination by transferring them to the other container. In the end he much preferred pouring the whole container of bulbs into the empty one! That takes a lot of skill! So back and forth the bulbs went! He LOVED hearing the "kerplink, Kerplunk" sounds! Until he realized it was fun to roll them all over the floor instead! Ha! He showed me who was in charge of this activity!! As noted above, this activity would work with a number or other materials, too-- just as always, be watchful with little hands working with little materials. Adult supervision is recommended. I also encourage you to document these types of activities with your little one via camera. You can get some great expressions of concentration, joy, and/ or smiles over a job well done... or a mess well-made!